I did a bit of research beforehand and decided to try out a recipe by Bron Marshall. Everything was going well and it was looking more and more appetising as I assembled the onions, fig slices and cheese on the pastry. Sadly the proof wasn’t in the pudding. The onion and fig filling was delicious but I didn’t like the puff pastry base with it and there wasn’t enough cheese on top to give it a proper punch so overall it was a bit of a disappointment (I didnt make the mustard glaze though as I wanted pure fig and cheese flavours). However, not to be discouraged, I tweaked the recipe slightly and changed the pastry to short crust instead. Now I think it ticks all my ‘perfect fig and goats cheese tart’ boxes and hopefully yours as well (for those who are still in the puff pastry camp or want to make up their own minds, please refer to Bron’s recipe instead). I’ve just come back to add to this post because, reading it over it sounds as though I’m saying Bron’s recipe was a flop which wasnt my intention. There’s nothing wrong with it and I have only adapted it to get the result I had in my own mind, which is why I’ve suggested that anyone who reads this looks at both and chooses according to their personal preferences. Thank you Bron for the recipe and the inspiration! Adapted from the same recipe by Bron Marshall. Serves 4. Put the flour, butter and salt in a food processor and pulse until the butter is rubbed in (you can do this by hand if you dont have a food processor). Gradually add the water through the funnel until the dough comes together into a ball. Only add enough water to bind it and then stop. Wrap the dough in clingfilm and chill for 10-15min. Fry the onions on a medium heat until they are soft (about 10min). Add 2 tbsp of the sugar and half the vinegar and fry for another 15-20min until the onions are really sticky and most of the moisture is gone. Sit aside to cool. Meanwhile, pre-heat the oven to 180 degrees. Roll out the pastry and line a pie dish. Blind bake for 15-20min. Line the base with the onion mixture and season with salt and pepper. 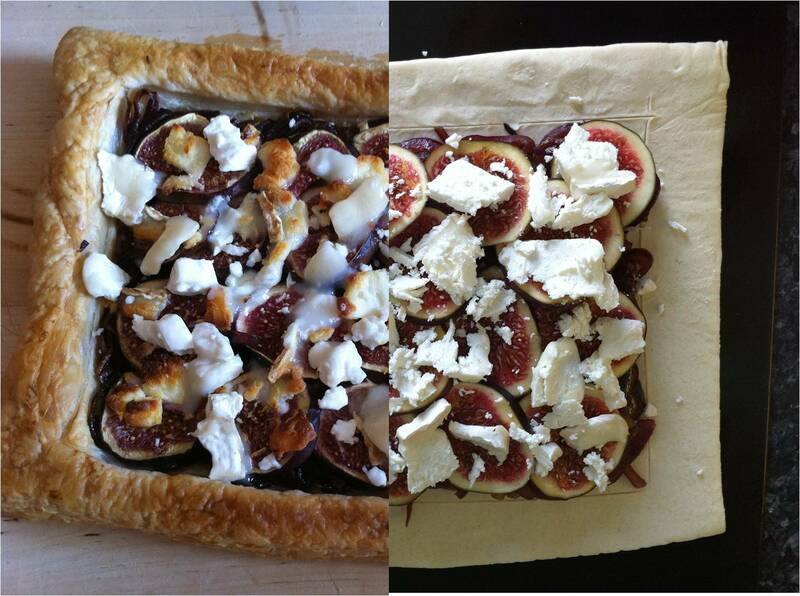 Lay the sliced figs over the onions and then lay the slices of cheese over the figs. Put the tart back in the oven for about 20minutes or until the cheese is melted and lightly browned. While the tart is in the oven, heat the remaining vinegar and sugar in a small pan until sticky and drizzle over the top when its ready (you can use pre-made balsamic glaze if you have it but it will be nicer warm). While I was writing about this recipe, my brain started to wander over other recipes which have taken me several attempts to get right (yesterday’s milk tart is one of these odysseys) and how “practice makes perfect”. One of the things I can remember my mom making when I was young is banana bread. It was wonderfully soft and damp without being too heavy and it smelled of vanilla and spices (and bananas of course). Unfortunately I don’t have a copy of my mom’s recipe so I started trying other’s until I found one that fitted my mental blueprint for good banana bread. Here’s my favourite recipe, please feel free to let me know if you think you can beat it though! Adapted from Nigella Lawson’s recipe (I left out the alcohol, nuts and sultanas because I was trying to recreate my mom’s but you might want to keep them in). Butter and flour a loaf tin and preheat the oven to 170 degrees. Mix the flour, baking powder, bicarb, cinnamon, nutmeg and salt and combine well. In a large bowl, mix the melted butter and sugar and beat until blended. Beat in the eggs one at a time, then stir in the mashed bananas and vanilla extract. Add the flour mixture, a third at a time, stirring well after each bit. Scrape into the loaf tin and bake in the middle of the oven for 1-1 1/4 hours until a skewer inserted comes out cleanish. Leave in the tin on a rack to cool. My favourite way to eat it is hot from the oven or toasted with a slap of butter. Mmmmmmm, hope you like it.